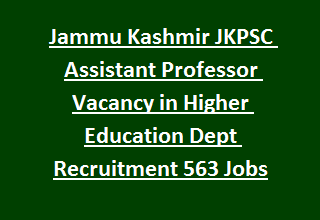 Professor Vacancies in this JKPSC Recruitment of Higher Education Department 49 Subjects. Candidates will be called for interview based on their SET/NET/SLET score, Ph.D and M.Phil or other professional courses marks percentage. There is no exam for this JKPSC Assistant Professor Jobs Recruitment Notification 2017. Online application for this Assistant Professor Jobs will be accepted through JKPSC Website of @jkpsc.nic.in from 28-10-2017 to 28-11-2017. It is mandatory to submit the application form online only for this JKPSC Recruitment of Assistant Professor Vacancy. More information of age limits, Qualifications, application details online, fee and other details are given below for this JKPSC Assistant Professor Jobs Recruitment 2017. There is total 563 Assistant Professor Jobs in this Jammu Kashmir PSC Higher Education Department Recruitment. Post code, Post Name and Number vacancy details are given below. Candidate must have qualified Post Graduation in relevant discipline and NET/SET/SLET/Ph.D/MPhil qualification is required. Fee for General category candidates is Rs.805/- and for all others Rs.405/-. Fee to be paid in J & K bank. Apply online only for this Jammu Kashmir Assistant Professor vacancy on or before 28-11-2017 through official website of JKPSC @jkpsc.nic.in. Pay the fee in J&K bank through chalan. Update your correct details of address and phone number, mail id. Last date for submission of application form along with all necessary documents, fee chalan is 01-12-2017.